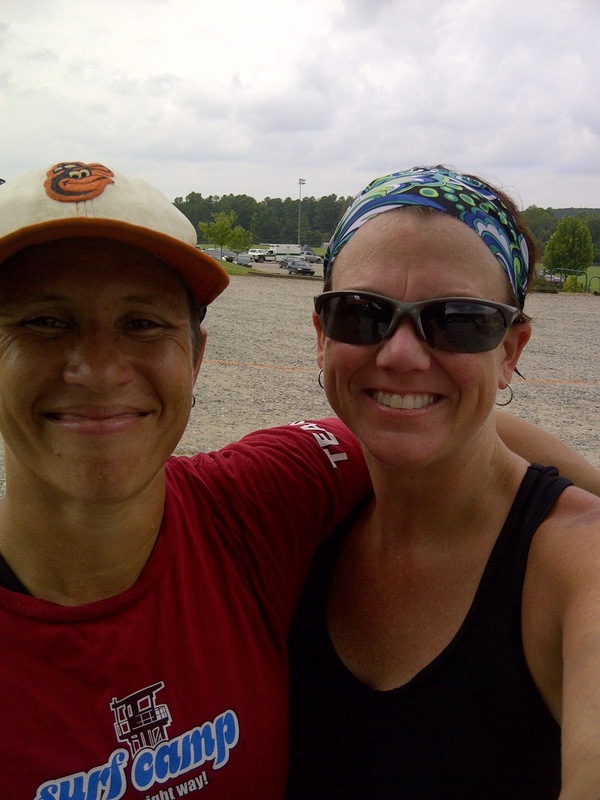 This past weekend I played triathlon! 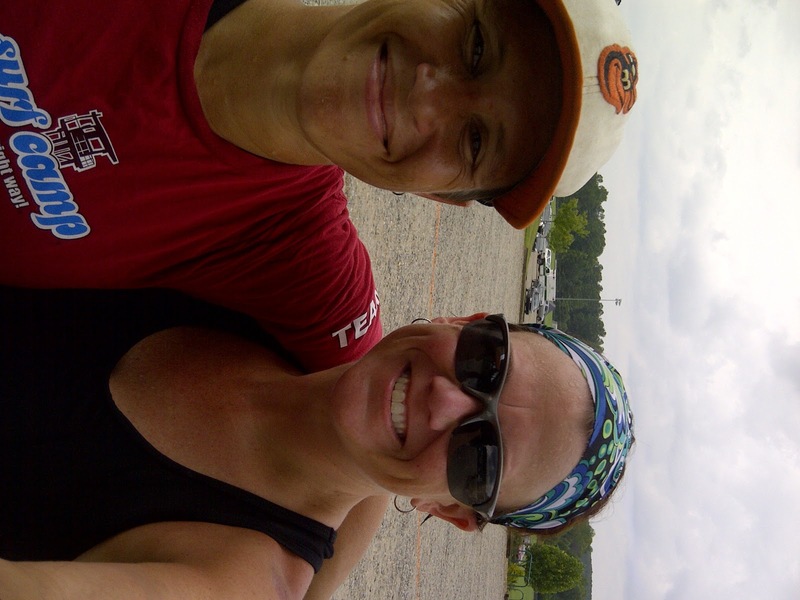 I competed in the Stumpy Creek International Tri in Mooresville, NC. I was excited going into the event - I felt well prepared and was ready to test Lucinda in her first race. Plus, Mooresville = ROAD TRIP! Lucinda's First Race. She was Excited. It was my first tri as an individual participant since Belews Lake in April and the first event since I restarted my IronFit heart rate training in May. My race strategy was just to have fun - play harder. I am blessed to be able to race and train for this sport. In most races, I tend to take myself too seriously and put so much pressure on in races that it messes with my head - and my performance. I had the perfect race buddy to help me PLAY HARDER. I made the road trip with JYo so the entire trip from Wilmington to Mooresville was a laugh- Olympics. We drove up on Friday and stayed the night. We walked to a nearby pizza place for dinner and watched the (real) Olympics as we prepped our bikes and gear for the next morning. 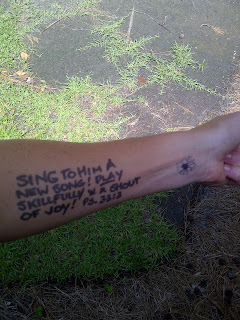 We both have a tradition of writing our mantras and scriptures on our left arms. Her mantra was RIDE VICTORIOUSLY and mine was PLAY HARDER. .
Verse and Flower on This Arm. PLAY HARDER written on the other. Plus, for several weeks as we've been training on our wee little hills in Wilmington, we've been talking to them: you're not a hill you're a sunflower. So we drew sunflowers on our wrists. We joked that even the swim was uphill, but the real challenge was the water temp. They announced on race morning the official temp: 86 degrees! Dude, that's only 26 degrees away from boiling! That's me, second from the right. I figure a watched lake never boils. The other swim challenge actually became an asset. The swim was counter-clockwise - a first for me. I was worried about sighting on the buoys but it turns out I could see them clearly and probably swam the straightest race since Azalea's race in the pool! Plus, the buoys set up my first play tactic: corkscrew turns at the turn buoys. I've been practicing them randomly, but decided to give it a shot. The Crawl Again. I Looked Just Like This. The advantage on the first buoy was clear, I cut the corner closely and gained a body length on another woman in my group. I tried again on the second turn and that one cost me a little energy. I kicked someone near me and felt winded - probably do to guilt and the extra effort to recover. I skipped the third turn and did a final corkscrew turn on the last buoy that marked the shore. It paid off - I shook off two other swimmers and beat them to the exit ramp. I don't normally have much to say about T1 but this one was my best one EVER! I killed it in :51 seconds. It normally takes me 2+ minutes to get onto the bike so I am excited that I was first in my age-group and 3rd overall for women in T1. 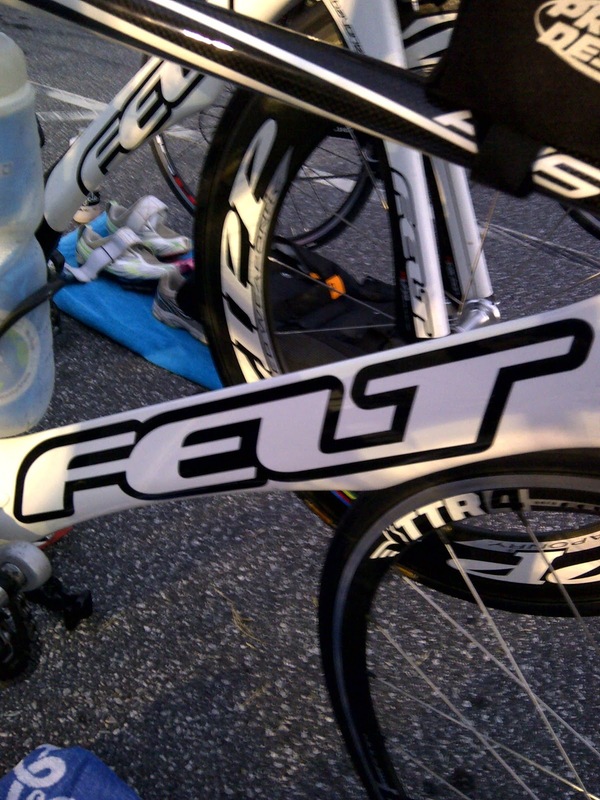 I practiced the swim to bike at least four times during the week before the race. I ditched gloves, headband and socks. I fastened my shoes and put on my shades after I was moving on the bike. 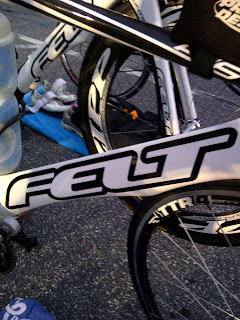 I would almost say it was hillier than the FLETCHER FLYER, but maybe it was because I was trying to maintain my speed. These hills seemed really loooooong. That hill in the first 2.5 miles and the double-doozie at mile 23-ish was no joke. Fortunately, there were some sweeeeet downhills. I reached 35.8 miles an hour on the downhill at mile seven and about 32mph at mile 19. Plus, the bike finish was a speedy downhill, too. I split the bike section into three parts and tried to play each section differently. For the first nine miles I sang [or I at least mouthed the words as I huffed and puffed up the hills]: Christmas carols, camp songs and even Katy Perry [I'm wide awake.....]. The second section was a little more rolling and felt nearly flat. I played leap frog with three other competitors. I tried to maintain my steady state at 20mph and really had fun. They could catch me on the up hills but I could gain on them on any flat. And in the last nine miles, I thought of all the games we used to play as kids: TV tag, Red Rover, Ain't No Bears, Boarding House (ala the Facts of Life), monster, etc. I tried to remember the rules or who we played with or who was the best at all the games. For TV tag, I tried to remember all my favorite shows: Little House on the Prairie and Dukes of Hazzard being at the top. 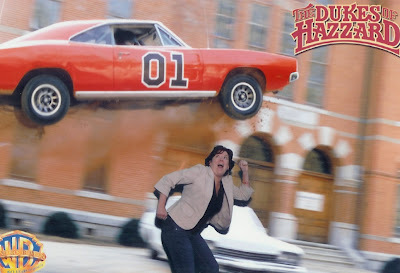 The General Lee and Me. I swear I caught some air on the downhill going 35mph. My goal was to finish within the 1h:30m mark and my official time was 1h:31m:14s. My initial goal was to finish in under one hour. In the first five minutes of the climb, I decided I'd be happy to simply run/shuffle the whole way - no matter what the speed. Five minutes after that, when the sun peeked out from behind the clouds, I decided that sticking to my heart-rate zone was my best bet. Of course, that meant walking quite a bit which led to a little mental battle (monkey mind) and some disappointment. I couldn't get my mind to get my body to do what my heart wanted to do. I turned to my mantra: I played. I shuffled with a side step, I skipped, I played air-guitar when I ran by the boom-box at the water stop, I talked with a fellow runner about bacon and Chick-Fil-A. I played mind games [I'd count to 100 in french as I ran up the hill, count to 25 as I walked and then start running to 100 again - french fartleks.]. I posed for the camera man [shocker]. I did have two favorite parts of the run: at my mile 1.5 and Jen's mile 2.0 we crossed paths. She was smiling and still running - a good sign for an excellent finish - since her last two races haven't been stellar (leg cramps, heat and misery). The finish was kind of crazy and fun. We finished on a downhill that took us off-road onto a gravel park path and around the edge of a soccer field. You could see the finish from a long way off and I could hear JYo yelling at me to hurry up. She promised they had cold Coca-Cola at the end. I sped up to a respectable sub-8min/mile in the last 400 meters and finished in 1 hour, 2 minutes and 4 seconds. My overall finish was 3:09:10 - several minutes faster than my Belews Lake race in April. I was disappointed at first - I wanted it to be closer to three hours (every minute over three hours stops being fun) - but as the week goes on, I'm actually pleased at my performance at the most challenging international race I've done. It will prepare me for the White Lake International in one month and propel me into the Beach2Battleship half iron in October! JYo and me. Post-Race Glee.